Sunday I watched that game at my brother’s apartment with a few friends. He served crudités; salami; asparagus wrapped with prosciutto; and tomato, mozzarella and basil. For the main event he made lasagna. 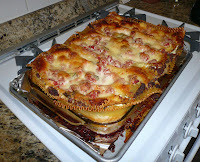 This dish was so big my son called it “30 pound lasagna.” I think there was some sort of physical reaction in the oven that caused the uncooked ingredients to quadruple in weight. We had leftovers the last few nights and it got better each time. For desert he made lemon bars, rocky road brownies and his famous 5th generation Rigelhaupt (Riegelhaupt) rugulah. (Other spellings: Rugelach ,Rugulach, Rugalach, Rogelach, Rugalah, Rugala.) Unfortunately you will never see this rugulah recipe posted on this blog as I have been sworn to secrecy and revealing it would strike a blow greater than the outcome of the game. In fact, I have decided not to even publish a photo of them as bakers at places such as Zabars might be tempted to try a photo analysis to duplicate the 100 year old recipe. But trust me, they’re very good.